Sri Lanka, centuries back called as the ‘Eastern entrepôt of grains’ still owns acres of lush green paddy fields-harvesting piles of rice with the blood and tears of native farmers, who work hard in order to keep up with the demand of the nation. There is no doubt about the fact that, these individuals do not get the due gratitude for the service they render, but keeping that aside do they even receive the privileges, they are bestowed with? More importantly, do farmers, especially in those rural areas receive the basic health education and care, they deserve? Well, our discussion today is neither on farmers nor grains, but ‘Snake bites-once known as the ‘Neglected ‘disease of poverty’-one of the paramount health issues faced by the community mingling with cultivating and harvesting to satiate our hunger. Decades back, this problem was only restricted to farmer families in peripheral areas like Anuradhapura, Polonnaruwa, Puttalam or Kurunegala. But following humans encroaching natural habitats of the snakes, they have started invading ours, to suburbs to cities, taking us towards life-threatening circumstances and even death. Professor Kolitha Sellahewa, MBBS, MD, FCCP, FRACP (Hon. 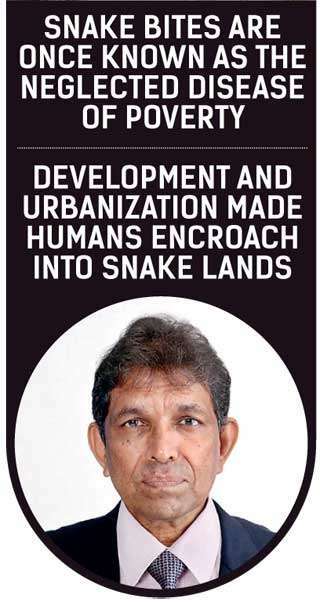 ), Professor of Medicine and Head of Department, is undoubtedly the best person to talk on this crucial keynote, heading the Chair of the Snake-bite Expert Committee of the Sri Lanka Medical Association, having initiated a number of projects to decipher the enigma of snake bites and saved thousands of lives with his years of experience, comprehensive knowledge and inquisitive approach to research studies. According to Professor Sellahewa, there are 96 species of snake, identified so far, out of which, only six are deadly venomous. A few decades ago, most of these snakes were only found in rural areas but due to urbanization and several other factors, a considerable snake population is noted elsewhere, even in highly urbanized areas like Colombo and Kandy. “This discipline of medicine addressing snake bites and its treatment didn’t have a clear-cut edge with documented data, records or statistics in Sri Lanka until 1980, after which the Snakebite Expert Committee of SLMA was established and its members initiated several research studies and awareness programmes for both healthcare professionals and general public, making a significant positive impact on the community in dealing with snake bite victims” he added. How does a snake bite cost a life? According to the professor, venomous snakes are distinguished from non-venomous ones, by the presence of a pair of cephalic glands, which produce venom and enlarged Maxillary Teeth commonly known as Fangs. Snake venom contains powerful tissue destroying toxins, which are mostly directed against nerve and vascular tissue, resulting in impaired clotting, neurological disturbances and local inflammation. These effects will vary according to the species of the snake and if immediate treatment is not provided, even the potentially reversible outcomes could get worsened and deteriorate the patient, until his life is taken away. Prevention is always better than cure-does it apply to snake bites too? When it comes to snake bites, it would rather be ‘avoidance’ than prevention. Being an occupational hazard, most of the time and an accident at other times, snake bites are not easy to be avoided yet, proper attention and awareness would definitely limit the vulnerability. Know what times of the year, what times of day or night and what kinds of weather they are most likely to be active. Be cautious about snakes, especially after rains, floods and at harvesting times. Wear proper shoes or boots with long trousers, especially, when walking in the dark or in the undergrowth. Use a torch when walking at night. Stamping the feet and tapping with a stick serves to scare away snakes from the pathway when walking owing to their sensitivity to vibration. Avoid snakes as much as possible -never handle, threaten or attack a snake. Some people have this off-target impression that they need to bring the, snake-alive or killed, to the hospital following the bite, for medical treatment to be started. “There is no truth in that at all. In fact, it would be easier for us, health care professionals, if the snake is brought to the hospital to identify and start treatment accordingly. But even if the snake is not there to be seen, we still can determine the species by considering factors like the time of the day, envenomation location on the body, circumstance of the bite (walking in a paddy field, sleeping in the watch-hut), site of the bite, and the clinical symptoms of the patient,” Professor Sellahewa said. Cobra-water bodies, inside the house. Russell’s Viper and Cobra-Arms and legs up to knees and elbow. Krait – Any site from head to toe. Local swelling and blister formation-Cobra, Russell’s viper and hump-nosed viper. Do not wait until signs and symptoms appear to seek medical care. Do not let the patient to panic and run around as increased blood circulation can aggravate the spread of venom throughout the body. Do not put tourniquets or tie up above the bite wound as this can cut down the blood supply resulting in further tissue damage. Do not apply cold compresses or ice on the bite site. Wash the bite area gently with clean water. If the victim seems to be breathless, try mouth to mouth breathing until taken to the hospital. Particularly important after krait bite. Anti-venom, the only antidote for snake venom is currently available for systemic envenomation by Cobra, Common Krait, Russell’s Viper and Saw Scaled Viper. This polyvalent anti-snake venom, raised from horses, is currently imported to Sri Lanka from India and has limitations in its efficacy and safety due to the fact that they are manufactured against toxins created by the venomous snakes in India, which might not be 100% compatible with those created by venomous species found in Sri Lanka. “Adverse reactions to imported anti-venoms have always been a problem and making matters worse, Hump Nosed Viper being the culprit of most of the snake bite cases in our country is not covered by this anti-venom, ” Professor Sellahewa said. According to the professor, bite victims are usually managed with symptomatic and supportive care in the hospitals. “This issue has been there for a long time and that was why we thought of taking measures to manufacture our own anti-venom utilizing venom from Sri Lankan snakes, which would cover all these species of deadly venomous snakes, found in Sri Lanka. Turning a new page on anti-venom treatment, a remarkable initiative has been taken by the Snake Bite Expert Committee of Sri Lanka Medical Association in close collaboration with the Instituto Clodomiro Picado (ICP) in Costa Rica, Antivenom research international California (AVRI)USA and University of Peradeniya. “The need for more efficacious and safer species-specific anti-venom, including the Hump-nosed Viper was eluded to by me as far back as 1996. However administrative barriers, bureaucratic apathy and red tape hampered our progress. “Having overcome the barriers and relentless commitment to providing an urgent need for the poor and destitute in this country we can, at last, see the light at the end of a tunnel, we traversed for 20 long years,” Prof Sellahewa said. “A test batch of new polyspecific antivenom for the highly venomous snakes including the Hump-nosed Viper has been manufactured at ICP, Costa Rica. And the anticipated successful completion of the ongoing clinical trials at Peradeniya is expected to make it available on a commercial scale in the not too distant future,” he said. Additionally, with further developments from these initial stages we will not only to be able to cater to the therapeutic needs of Sri Lankan snake-bite victims but also enkindle a boost in respective authorities, to contrive on manufacturing our own anti-venom within the country itself, using local expertise and transfer of state-of-the-art facilities with the potential of exporting antivenom to other countries and thereby contributing to employment generation and a remarkable growth in the economy of our country,” Professor Sellahewa said. We may not be ‘breathing clean’ after all !